Research at the USC Viterbi School of Engineering has revealed new evidence for the occurrence of ground ice on the protoplanet Vesta. The work, under the sponsorship of NASA's Planetary Geology and Geophysics program, is part of ongoing efforts at USC Viterbi to improve water detectability techniques in terrestrial and planetary subsurfaces using radar and microwave imaging techniques. The study, conducted at USC Viterbi in the Ming Hsieh Department of Electrical Engineering by research scientist Essam Heggy and graduate student Elizabeth Palmer from Western Michigan University, took over three years to complete and was featured in the journal Nature Communications on its Sept. 12 release. Heggy is a member of the Ming Hsieh Department of Electrical Engineering's Mixil Lab, which is led by professor Mahta Moghaddam and specializes in radar and microwave imaging. Vesta is located in the asteroid belt between Mars and Jupiter and, due to its large size, is believed to be a differentiated body with a core and a mantle just like our own planet. Collisions between asteroids in the belt enable them to leave their orbits and travel great distances in the solar system, potentially colliding with other planetary bodies. Finding ice on these bodies is of major importance to understanding the transport and evolution of water-rich materials in our solar system. The team used a special technique called "bistatic radar" on the Dawn spacecraft to explore the surface texture of Vesta at the scale of a few inches. On some orbits, when the spacecraft was about to travel behind Vesta from Earth's perspective, its radio communications waves bounced off Vesta's surface, and mission personnel on the ground at NASA's Jet Propulsion Laboratory (JPL) received the signals back on Earth. According to Heggy, this system of radar signaling was like "seeing a flame from a lighter in the middle of day from the opposite side of the United States." 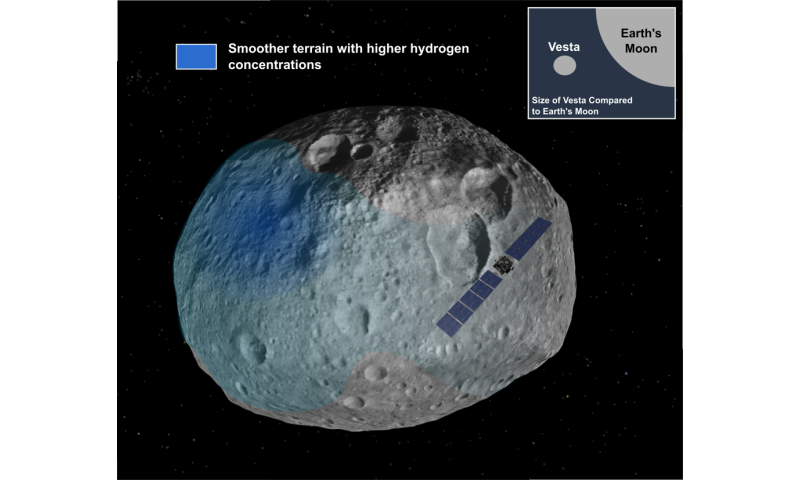 Despite the challenges in measuring such a weak signal from the Dawn Spacecraft communication antenna from nearly 300 million miles away, the team assessed the occurrence of large, smooth areas on Vesta that correlated with the occurrence of higher concentration of hydrogen as measured by the gamma ray and neutron detector (GRaND) instrument onboard. "I am excited that we were able to perform such an observation on Vesta. At USC we have been contributing to testing and developing several bistatic radar methods to explore water and ice on planetary surfaces and arid areas of Earth. As the largest research university located in an arid area of the planet, this effort is a natural outgrowth of our focus on understanding water evolution," Heggy said. The USC researchers hope their work will get the public excited not just about water in space, but also about the importance of understanding water evolution in arid areas under changing climatic conditions.